Here’s your chance to be showcased within the hallowed halls of the Worcester Art Museum! 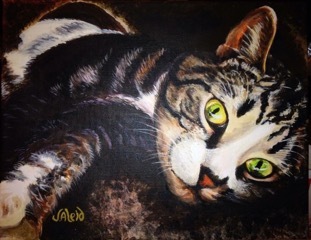 The WAM is having an open call for artists for their upcoming “Cats” themed show. The show runs from May 21 through September 4, 2016. The overall show is called “Meow” and as part of that they’ll have a Community Cats show aimed at the local constituency. It will help to support the Worcester Animal Rescue League. Local artists can submit a work with a donation of $10. That donation will be split between the WARL and the WAM’s educational wing. If you wish to participate you have to submit your Intent to Participate by April 26, 2016 via snail-mail with a check for $10 (or more). It must be received by that date. You then bring your framed and wired piece to the WAM on May 13 from 10-4 or May 14 from 1-4. It must be within 48″ wide. They do accept sculptures and other styles of work – full details are on their site. The reception is Sunday, May 22, 2016 from 1-3pm. Pickup is July 30, 2016 from 1-4pm. The image shown here is by talented BVAA member Janet Aleid.